When we first found our house, the porch/backyard area was one of the main factors on choosing between some others in the neighborhood. Our house was the last available one that overlooks a huge 80 acre farm. The privacy and intimacy of this adorable back porch was a major #OhYesPlz moment. A cozy, covered back porch was something I had dreamed of for years. I knew I wanted a space for entertaining as well as a area that we could hang out with the pups. I am definitely not disappointed with how everything turned out. I still have lots I want to do, as well as pull out some Fall decor soon but this is the perfect base for every season! We love, love, love making s’mores out here, watching scary movies, enjoying morning coffee & HGTV while the pups play and just letting them lounge while I’m in the kitchen or bedroom. I can’t wait to share this space with you more as it grows! If you’re looking to decorate a porch, patio, balcony or even a small little nook– don’t worry about size! In my opinion, the smaller the cozier! I also think an outdoor space is the perfect place to let your personality shine. Collect knick knacks from travels, find fun pieces, etc. I also love to fill the space greenery! I have intentions on planting many more plants. I love the over flowing greenery in every little corner. I also love adding floor cushions for guests, big lanterns and fun, oversized yard games! On our outdoor tea cart, I keep gifts from family and friends (like old beer bottles), bottle openers, koozies, candles, etc. Have fun and make it your own! Since we are spending SO much time out here grilling, I had to find some easy side dishes that don’t require much effort or time spent inside. 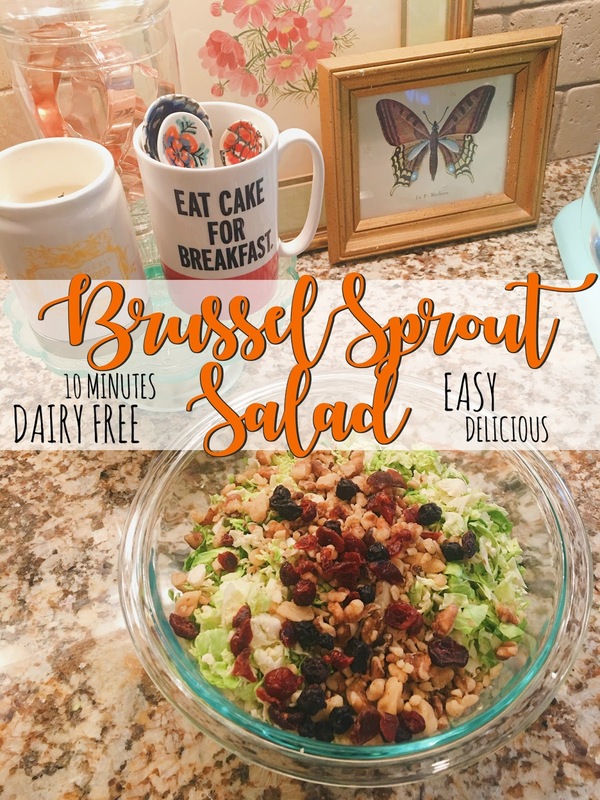 Today I’m sharing the most delicious Shaved Brussel Sprout Salad recipe. You could add Turkey Bacon to this recipe for an extra touch, it would be delicious but is also amazing without it. I made this salad for Labor Day weekend and I got so many compliments. You’ll be blown away by how easy it is, yet so incredibly tasty. Next Post Dark Chocolate Chip Pumpkin Cookies // 3 Ingredients + 60 Calories Each!